This accessory is used to open portions of a wall that are normally used for access. Framed opening refers to the framing members and flashing which surround an opening. Framed Openings include: Jambs, Header or Sill, Trim, and fasteners. Double Header: Option (see below) will provide a double header, used in the attachment of some roll-up doors. This second header must be field located. Full Cover Trim: Provides head and jamb cover trim and sill trim if applicable, so that no red iron is visible at the opening. 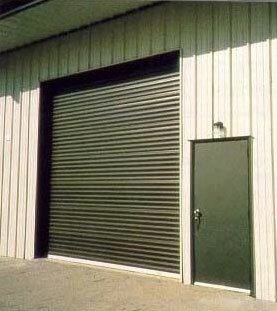 Usage: Frame out doors, windows, louvers, and any other openings. With a bypass girt condition the header has to drop 8″ to 10″ below the eave strut and with a flush girt condition the header only has to drop 3 1/2″ below the eave strut. The jamb has to be located at least 1′ 6″” off a column line. Exercise caution with framed opening in an endwall, the endposts may have to be relocated to accommodate opening. Also, exercise caution with framed openings in a sidewall, bracing may have to be relocated to accommodate opening and special doors may be required in low clearance areas. Furnished with or without header and jamb cover trim. Cost versus aesthetics.